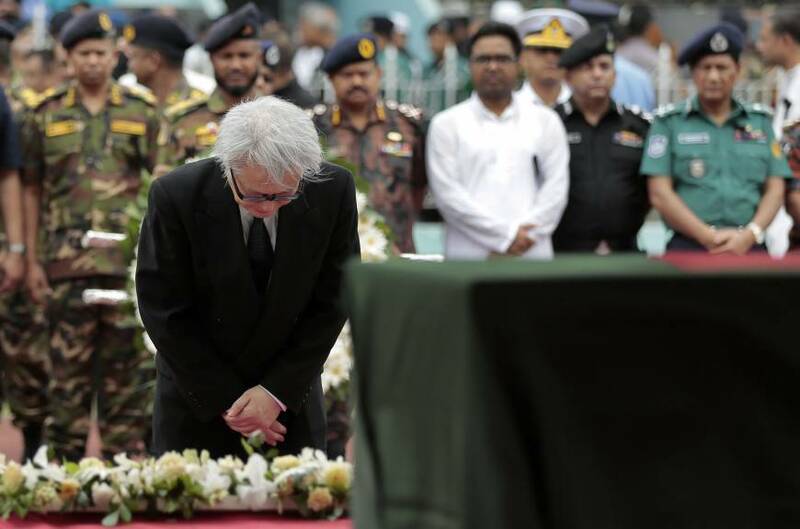 Bangladesh stepped up its probe into the Dhaka hostage siege Monday as relatives of the seven Japanese victims witnessed their suffering firsthand when they viewed and identified the tortured and disfigured bodies. The 18 family members, who arrived aboard a Japanese government airplane late Sunday night, were met on the ground by Senior Vice Foreign Minister Seiji Kihara. Kihara, who is part of a government unit investigating acts of terrorism, said the relatives appeared exhausted and speechless. The bodies were expected to arrive at Tokyo’s Haneda airport Tuesday morning. Accompanying the relatives on the jet were officials from the Foreign Ministry and the Japan International Cooperation Agency, the government aid unit for which the victims were working as consultants on a development project in Bangladesh. 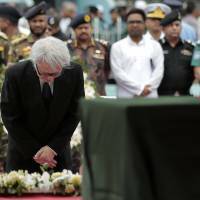 Twenty hostages, including nine Italians, seven Japanese and one person each from the United States and India, were confirmed dead after the nightlong siege by heavily armed Islamic terrorists in an upscale restaurant favored by expatriates in Dhaka. The Islamic State group claimed responsibility. 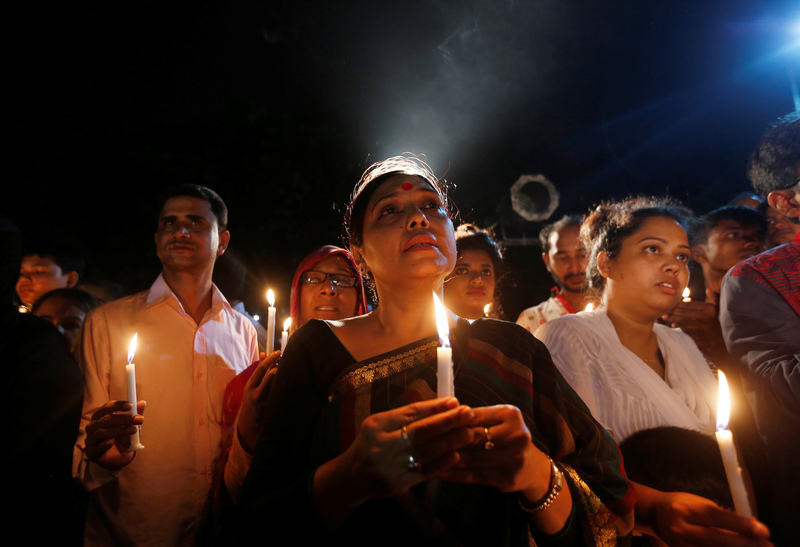 While the massacre left many stunned, analysts said the killings were the result of Bangladeshi authorities allowing Islamic extremism to grow and fester. The attack was the latest in a string of targeted attacks on foreigners, activists, bloggers critical of Islam and religious minorities. While many of the attacks in the moderate Muslim nation of 160 million have been claimed by both the Islamic State and al-Qaida-linked groups, the government of Prime Minister Sheikh Hasina has been steadfast in its assertions that neither group operates in the country. 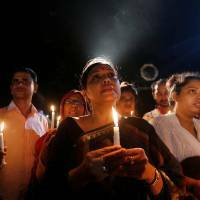 Police have said the Dhaka attackers belonged to the banned domestic group Jumatul Mujahedeen Bangladesh (JMB) and that their families had not heard from them in months. “They are all Bangladeshis. They are from rich families, they have good educational background,” Home Minister Asaduzzaman Khan was quoted as saying. Asked whether they might have had links to the Islamic State group, a police chief said investigators are looking at that possibility, the Associated Press reported Monday. The Hasina government has long said the Sunni extremist group, which is based in Syria and Iraq, does not maintain a presence in Bangladesh. Instead, it has blamed the spate of attacks over the past year on the political opposition, writing off the violence as attempts to destabilize the government. Experts, however, cautioned against dismissing Islamic State and al-Qaida. “Both IS and al-Qaida … have competed to claim credit for dozens of brutal assassinations in Bangladesh,” Greg Barton, an Islamic studies professor at Deakin University in Australia, told The Japan Times via email. On Sept. 28, the Islamic State group said it was behind the killing of Italian citizen Cesare Tavella in Dhaka’s diplomatic quarter. In October, masked assailants on a motorcycle killed Japanese citizen Kunio Hoshi in the country’s north. Again, IS took credit. Both attacks were blamed on local Islamist groups and the political opposition. But eight more attacks quickly followed, each claimed by IS. Analyst Clive Williams, a terrorism expert at the Australian National University in Canberra, said political turbulence in early 2015 had a significant impact on security, as Hasina and her longtime rival Khaleda Zia fought over election results. This turbulence created fertile ground easily exploitable by Islamic extremist groups, Williams said by email. Groups that are now active there include the al-Qaida-affiliated Ansarullah Bangla Team, al-Qaida in the Indian Subcontinent (AQIS), the Islamic State group and JMB. Williams points to the numerous terrorist attacks and periodic discovery of cells and hideouts, with stockpiles of weapons and explosives indicating continuous efforts by terrorists to put down roots, taking advantage of the polarized politics. “The government does not want to acknowledge that both al-Qaida and IS are influencing terrorist violence in Bangladesh,” he said. Experts say that while the government has been reticent to acknowledge both Islamic State and al-Qaida claims, the links between local and global terror groups are likely still evolving. As IS loses territory in both Iraq and Syria and as its finances are drained, it is looking to build affiliates in countries such as Bangladesh where it can exploit disaffected youths. The group has bragged of its intentions to declare “provinces,” or affiliates, in Tunisia, Somalia, Egypt, Lebanon, Indonesia, the Philippines and Bangladesh this year and in 2017. “The question of international networks — like IS or local networks like JMB — is not strictly an either/or matter, said Deakin University’s Barton. If it was conducted by a local group, the Dhaka massacre this weekend saw a large shift in tactics, meaning that a more experienced group may have played a role in helping formulate the strike.